The Michael Kors Access Sofie is an eye-catching smartwatch with a great display. Fitness fans will lament the lack of key features though, and everyone will miss Google Pay. An update to 2016's Michael Kors Access Bradshaw smartwatch, the Michael Kors Access Sofie shows the fashion brand has taken past criticisms on board and worked hard at producing a glitzier and more stylish fashion smartwatch than we've seen before. 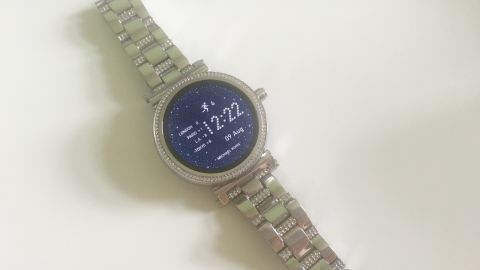 The omission of a few key features will dissuade some wearable fans, but there's no denying that this is a glamorous if expensive smartwatch option for many. That said, it is often on a par with many more inexpensive competitors, so is the Access Sofie still worth considering? The Michael Kors Access Sofie has been in the works since March 2017. Targeted towards women, it's suitably glamorous if much more of a fashion accessory than a practical smartwatch wearable. With an RRP starting at $350 / £349 / AU$599 it's a premium entry to the wearable world, with the watch now on sale through Michael Kors stores and online, as well as at third-party retailers. Some shops stock it for less than the RRP, but it remains a pricey proposition. The Michael Kors Access Sofie isn't hugely feature-rich, but it is a tempting option for those looking for something that wouldn't look out of place when fine dining. Michael Kors has a well-established reputation within the fashion world, and such style follows it when it comes to smartwatches. The Michael Kors Access Sofie has a fully round display, eschewing the 'flat tire' effect of its predecessor - the Michael Kors Access Bradshaw - and looking all the better for it. A single button adorns the right-hand side of the face and is the sole means of operating it in a tactile way. Like many other smartwatches including the Misfit Vapor, and LG Watch Sport, the crown doesn't rotate, nor does the bezel. Scrolling through the list of apps is solely down to using your fingers. The bezel is embellished with gemstones, with the stainless-steel strap also providing gemstones at regular intervals within the links. It's essentially the signature style of Michael Kors and exactly what fans of the fashion designer will appreciate. Such glitz won't be for everyone though. A 42mm stainless steel casing alongside so many gemstones mean this isn't the lightest of watches. It feels weighty in your hand as well as on your wrist, but that does immediately convey the feeling that this is an expensive smartwatch rather than the more casual design of something like the Fossil Q Venture or the overly plasticky appearance of many of the basic Apple Watches available. It's possible to swap out the very glamorous gemstone strap, although it is a little fiddly to re-attach new straps. It's worthwhile ordering alternatives though as the standard design would look a bit out of place when running errands throughout the day. It looks more like something you'd want to embrace while on a stylish night out than simply rushing around a supermarket. As standard, the gemstone strap is a little on the large side. Adjusting it requires a visit to a watch repair place or a Michael Kors store, so bear this minor inconvenience in mind before making a purchase. Rated for IP67 water protection, you should be able to take the Michael Kors Access Sofie into a shower without a problem, and it will withstand being immersed in 1 meter of water for 30 minutes. None of this we'd recommend, given this is a fashion statement rather than a rugged wearable, but it's useful to know that a minor water incident won't ruin things. Dispensing with the flat tire approach of old, the Michael Kors Access Sofie has a fully circular display. The 42mm diameter watch face is notably high-end with its 1.19-inch AMOLED screen offering a resolution of 390 x 390. It means that clarity and brightness is at the forefront here, with all text, notification icons and watch faces looking very clear, no matter how bright or dismal the weather around you might be. It's possible to tweak the brightness level to whichever setting you want, as well as whack on Always On so that the watch face merely goes monochrome while still displaying the time when you're not using it. Obviously, battery life is impacted if you leave brightness on full, but it does ensure that the Michael Kors Access Sofie is extra easy to read. We were also impressed at how well it handled direct sunlight, with seemingly no viewing angle causing it a problem. Its high clarity also means you'll feel like you own a premium smartwatch that reflects the price tag. Despite the chunky exterior of the Michael Kors Access Sofie, the watch display itself isn't as big as some alternatives, such as the Apple Watch 3, but it is on a par with direct competitors like the LG Watch Style and Huawei Watch 2. If you have large fingers, you may find it occasionally difficult to tap and select small icons, but it's not a deal-breaker when you consider that owners of women's watches will typically have smaller hands anyhow.